Let us match your face with the correct color foundation after you have enjoyed your facial, massage or even had your hair done. educate in this make up line. Glo minerals makeup covers, corrects, and protects skin. It’s beneficial for all skin types and conditions, delivering that flawless finish everyone is searching for. Glo minerals makeup is embraced by Dermatologists, Plastic Surgeons and Skin Care Professionals. Glo Minerals are uniquely formulated, utilizing only the finest pharmaceutical-grade ingredients, triple milled high pigment minerals and an anti-oxidant blend of vitamins A, C, E and green tea extract. UVA and UVB protection helps defend against free radical damage. We can do on site for weddings and special occasion (in town) for additional cost. We will design the perfect look for you. Forget all the guesswork and allow us to take care of everything. For prices and products go to the Glo Professional site. THE NEW LUXE FOUNDATION: (Glo-professional) Harness the light-refracting power of diamonds to bend light for a soft, ageless complexion with glominerals Luxe Liquid Foundation. 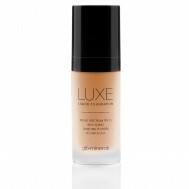 Luxe Liquid Foundation is formulated with light-diffusing diamond powder, broad-spectrum UV protection and specialized moisturizing agents to deliver a flawless, youthful complexion.